Here are some extracts from a piece in Direct Action for 14 October 1916 (just two weeks before the first conscription referendum). 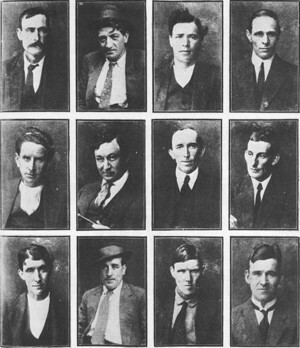 Direct Action was the Sydney-based weekly newspaper of the Australian arm of the Industrial Workers of the World (IWW or Wobblies), edited by Tom Barker (when he was not in gaol). On the same page of the paper, there is a greeting from one of the dozen men then in Long Bay gaol, charged with treason. ‘The Sydney Twelve‘ had been charged under an 1848 Act in an atmosphere of hysteria and in the midst of the disputation leading up to the first conscription referendum. Despite a public campaign, they were all found guilty and sentenced to gaol terms of from five to fifteen years. All spent at least some years behind bars. The author of the piece below was probably Bill (Hobo) Jackson, an itinerant IWW organiser. ‘Boneheads’ is said to have been a favourite IWW epithet. The question that is at present agitating the minds of the workers of Australia is that of Conscription. Each one of us must decide immediately what course of action we will adopt in order to frustrate the efforts of the master class to further shackle the workers with the most tyrannical form of slavery the workers in history ever had to endure — Militarism applied on the job. Under the cloak of the Flag, the Empire, Our Country, National Honor, Scraps of Paper, and other incomprehensible symbols the Federal Labour Party and other intoxicated patriots positively demand that we shall provide by the end of October 49,000 able-bodied men to deliver ourselves up to the nearest recruiting depot in order that we may be drilled, disciplined, organised, and shipped 13,000 miles away to fight Germans, Austrians, Turks, and Bulgarians. The question which we ‘wide awakes’ are asking ourselves, ‘for what reason?’ We are called upon to make more sacrifices on behalf of ‘THE EMPIRE,’ and it will rest with the working stiffs of Australia whether they will make any further sacrifices. The question of Conscription has been reasoned out from many standpoints, and we of the I.W.W. consider our point the only logical one, and that is from the point of view of interests, we consider that the working class movement of Australia will be cast into industrial oblivion should the workers allow the political tools of British capitalism to bluff them into accepting Conscription. 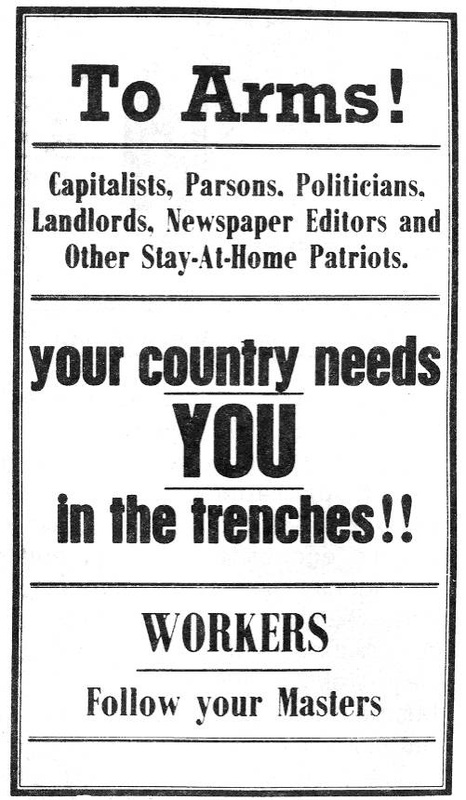 The supporters of conscription are using popular colloquial terms in enjoining people not to desert ‘our cobbers in the trenches’ but the people making these pleas are the same people who have grown fat on the backs of the workers. Meanwhile, if Lloyd George says conscription is not militarily necessary in Britain why is Australia going for it? There are millions of Russians and plenty of military officers’ servants now behind the lines who could be thrown into the breach. Allowing for a proportion of Australian eligibles being found medically unfit the numbers we could provide would make very little difference. So you may now see the fallacy of the argument for Conscription. It is plainly evident to any working man or working woman who will just pause and think for a moment that the British politicians are in desperate straits, and the Labour controlled Commonwealth, by adopting Conscription might be the means of their salvation. Conscription is not required for military purposes, but to further enslave us, and we will be robbed of the little liberty of conscience and freedom of speech that has been purchased at the price of torture, Persecution, and the Martyrdom of our ancestors. We will be imprisoned, brutally assaulted and sentenced to death on the flimsiest of charges, as has been the case in other countries which have adopted Conscription. Conscription will result in the most brutal, terrorising, and demoralising form of Government in existence, namely, Government by military caste. Conscription enslaves the noblest of mankind, intensifies oppression and cruelty, invests absolute power in a military tyrant, makes the woman a manual labourer, and encourages child labour, starves the poor, fattens the rich, and bloats the sweater. The Crisis has come! The calamity of war with all its horrors and affects now threatens us with a new tyranny — Conscription. Think! Workers who say NO forever deserve gratitude of their fellow workers. We say with all the passion of our manhood, ‘No man shall go against his will,’ and what shall it profit the workers if ‘the ALLIES’ gain the whole world and crush our individual liberty in the process. The Sydney Twelve. This is an illustration in an article by Hall Greenland, ‘Don’t mention the war – at home‘, Labour History Melbourne, 3 September 2016. Greenland contrasts the lack of recognition by the official commemoration industry of the turmoil at home with its obsessive interest in battles. His article is a good summary of the conscription struggle during 1916. He is correct about the lack of interest from institutions like the Australian War Memorial as the Memorial’s ‘Events’ page for October shows. Don’t miss also the special presentation on 7 November on ‘Making do in Germany with ersatz items‘, a big issue on the German home front during the Great War.